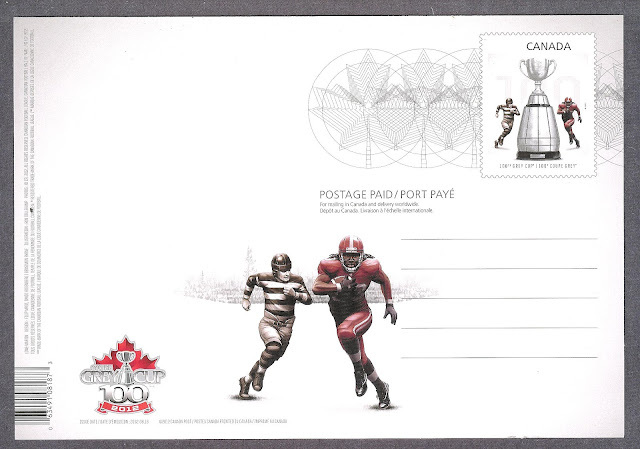 In 1909 Earl Grey, the Governor General of Canada, donated the Grey Cup for Canada's National Football Championship. 2012 sees the 100th Grey Cup game (no games were held between 1916-1919) and this is being commemorated by Canada Post in their 2012 stamp program. 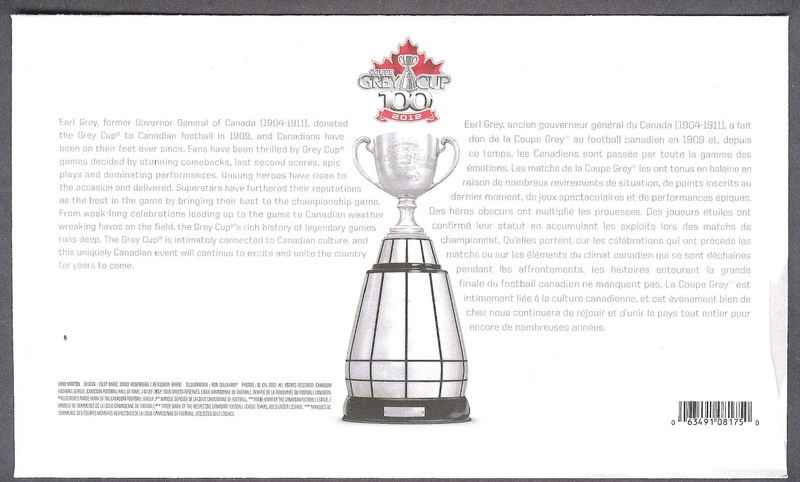 Commisioned in 1909 and costing $48.00, the Grey Cup is made of sterling silver and is 13 inches tall. The base was originally made of wood, with silver shields engraved with the winnings team name. In 1947 it was almost destroyed in a fire at the Toronto Argonaut Rowing Club's clubhouse but escaped with only minor damage after catching on a nail after the shelf it was sitting on collapsed. It has been broken 4 other times. In 1978 it was dropped by the celebrating Edmonton players; in 1987 and Edmonton player sat on it; 1993 saw Edmonton player Blake Dermott head-butted it and in 2006 when it broke away from its base during as the BC Lions celebrated their Grey Cup victory. 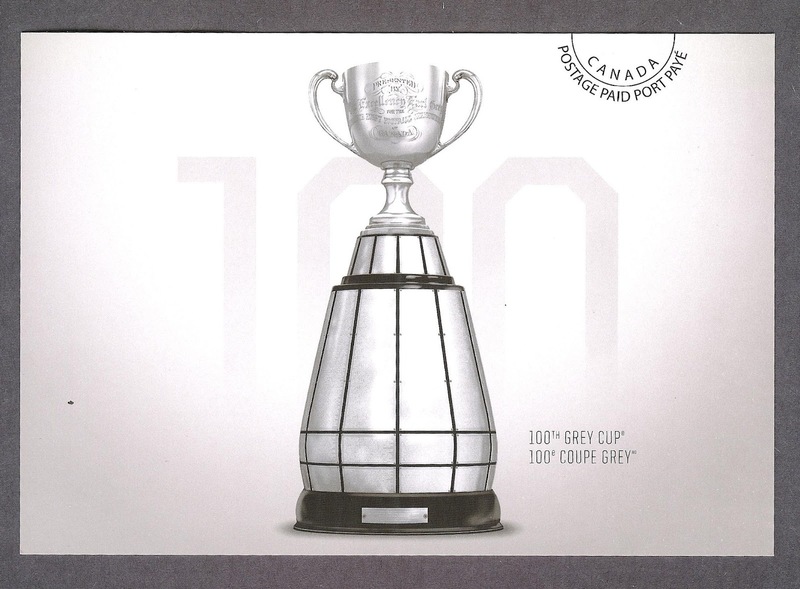 On two occasions the Grey Cup has been stolen. In 1967 as a prank, it was taken from the Hamilton Tiger Cats for 3 days. In 1969 it was stolen from the Ottawa Rough Riders and the thieves tried to ransom the trophy to the CFL. 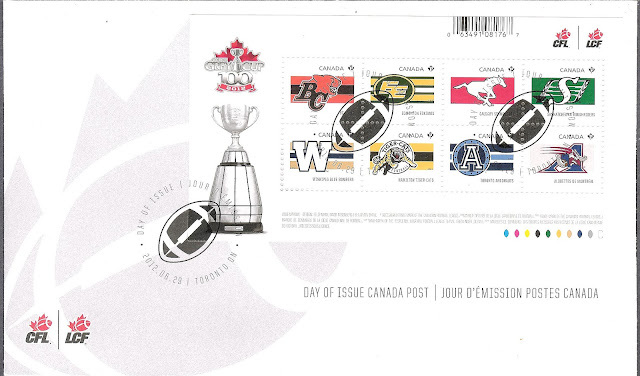 The CFL refused to pay and planned to create a duplicate trophy to replace it. 2 months later the trophy was recovered from a locker at the Royal York Hotel in Toronto after an anonymous phone call led to it. The Grey Cup Trophy is a Canadian Icon. Next week another post will discuss the Grey Cup Game and the current teams who are vying to play in the 100th Grey Cup.